The Help Menu in OS X is an underused but great resource when trying to learn about new Mac apps, and it can even function as a keyboard-based action launcherto quickly access app features. If you’re using the Help Viewer to actually read help documentation though, you may have noticed that the windows default behavior is to hover over everything else, even if it no longer has the focus. While that makes a certain level of sense, it can be frustrating if you’re on a smaller screen or you just want to be able to treat a documentation window as anything else, letting it go behind other app windows. A quick defaults write command will allow you to do exactly that. Hit return, changes should take effect immediately without having to quit any apps. This works in OS X Mountain Lion, Lion, Snow Leopard, and even earlier versions of Mac OS X. Does not work for me, even using sudo. 10.8.2, i7 iMac. Works great for me! I’ve been looking for something like this for ages. Now if only there were some similar commands to make such behavior universal to keep assorted dialog boxes from taking over tops spot on the screen. I do a lot of typing while looking at paper and therefore I’m not looking at the screen more than 40% of the time. It really bugs me when I’ve typed several hundred words only to look up and find some dialog box (little snitch, for instance, but there are many others) that took control of my input and everything after it popped up is lost. If anyone has such a solution, I’d love to hear about it. The Terminal command works in El Capitan (OS X 10.11)…BUT if the Help Viewer window winds up being behind other windows how do you bring it to the front again? It does not appear as an app when you press Command+Tab. When it’s hidden behind an app that occupies the entire screen, such as Final Cut Pro X, how do you click on it? Since that is not possible, how do you bring the Help Viewer forward? Expose’ shows all the windows on the current desktop panel. This is usually tied to [F3] unless you’ve reassigned the function in preferences. 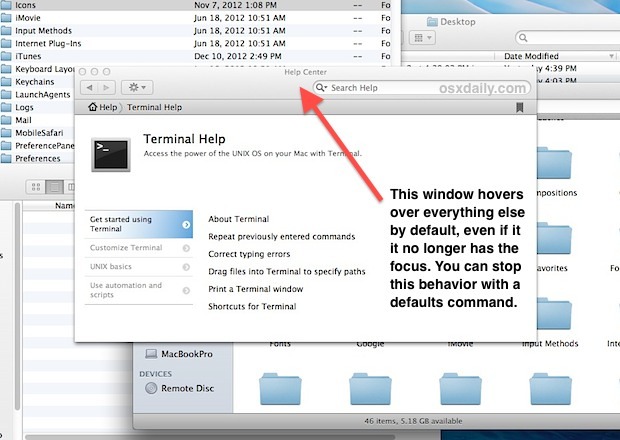 I’ve applied in Mavericks the defaults adjustment as described; the help window does stop floating over all, and it is still present and selectable when I expose all windows.